A Roller runs out of Ink. The ink tank is an object that Inklings and Octolings use to store ink. It appears in all battle modes. The ink tank is a cylindrical container made primarily of clear plastic, while its top and bottom are covered in green caps. Player characters typically wear an ink tank on their back during battle as a way to store ink. As players use a weapon, the content of the ink tank visibly decreases. 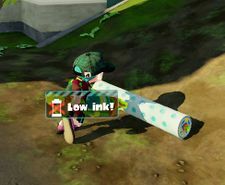 When an ink tank is nearly out of ink, weapons can no longer be used in their regular state, and a notification appears, stating "low ink!". Ink tanks can be refilled slowly by ceasing to use a weapon, or quickly by being submerged in a puddle of similarly-colored ink. While submerged, an ink tank icon will appear, displaying the current capacity of the ink tank that will disappear once the tank is full. Using a special weapon immediately refills the ink tank. The ink tank on the back of the player indicates the amount of ink in real-time. The ink tank will flash red when a player is out of ink. Upon using a weapon, the ink tank will temporarily stop recharging ink, showing a white space where the ink was used until the player finishes. An LED on top of the ink tank lights up when there is enough ink to deploy the sub weapon. While recharging ink, a slight sound effect will occur when enough ink has been restored to use the sub weapon. A small red arrow on the ink tank indicates how much ink is necessary to use the sub weapon. In Octo Valley, Agent 3 is given a unique Ink Tank from Cap'n Cuttlefish, along with the Hero Suit and the Hero Shot. It can be upgraded by bringing up the Power Up menu by pressing in Octo Valley. Using the Inkling Squid amiibo gives the chance for the player to unlock limited-ink challenges for Gusher Gauntlet, Floating Sponge Garden, Inkvisible Avenues and Spongy Observatory in which the player has to complete the levels without running out of ink. Agent 3 is given additional ink tanks, represented by a large indicator that appears on the left side of the screen, showing how much ink is left. These extra ink tanks are in addition to the player's normal ink tank. Agent 3's Hero Shot initially uses up ink from the additional ink tank. However, submerging in ink will only refill the regular ink tank. Once the additional ink tank is fully used up, Agent 3 can still use their regular ink tank, although it will no longer refill. Once the main ink tank is used up as well, the mission fails. The player is given one additional ink tank in Gusher Gauntlet, one and a half in Floating Sponge Garden and two in Inkvisible Avenues and Spongy Observatory. In Splatoon 2, the ink tank functions identically to how it did it Splatoon, although it now has a more stylized design compared to the first game. The indicator to show how much ink is needed in order to use a sub weapon now appears in the icon while submerged in ink. In Version 3.2.0, a new version of the ink tank was introduced. It has 10% more ink capacity than the normal version, and is visually wider and has a rounded cap. It is exclusive to the Splattershot Jr., Custom Splattershot Jr. and Kensa Splattershot Jr.. In Salmon Run, players have a lifesaver which also functions as an ink tank, having the contents of the wheel filled with ink where the ink depletes clockwise from the wheel. In Octo Canyon, Agent 4 is also given a unique ink tank from Marie, along with the Hero Suit and Hero Shot. It, too, can be upgraded, but now it must be upgraded at the Ammo Knights Enhancifier. In the Octo Expansion, Agent 8 wakes up with a uniquely designed ink tank on their back, resembling more of a backpack than a bottle. It has a hook which is used to hold a balloon that fills up and explodes, splatting Agent 8 whenever they fail a test. Agent 8 still wears the ink tank even during Unarmed missions. Octo Expansion introduces the Ink Refill item, which instantly refills the tank to full when picked up, while also featuring the return of limited-ink challenges, comprising of Ink & Watch Station, All That 8-Ball Station, Shrinky Ink Station and Dinky Ink Station. In this version of the limited-ink challenge, the player receives no additional ink tanks but can now use Ink Refill items. Submerging in ink does not refill the tank and displays a No symbol next to the indicator. Using up all ink leaves a couple of seconds to collect an Ink Refill. Failure to do so will cause the mission to fail. Official art of an ink tank. An Inkling with a full ink tank and a flashing red light, indicating that a sub weapon can be deployed. An Inkling depleting the contents of their ink tank. A roller with low ink. An Inkling refilling their ink tank. The unique ink tank worn as part of the Hero Suit. Concept art of Inkling fashion, with an early version of the ink tank - note the different colors of its caps. The ink tank used in Octo Canyon. Agent 8's unique ink tank worn in Octo Expansion. Agent 8's Ink Tank on the left. A preview of the new ink tank used on the Splattershot Jr. and variants. The lifesaver ink tank used in Salmon Run. The ink tank resembles a sports bottle with a plastic cap on top. Splatoon 2 makes a closer resemblance with a curved indent in it and a plastic latch on top of the Sub Weapon light. The larger-capacity ink tank exclusive to the Splattershot Jr., Custom Splattershot Jr., and Kensa Splattershot Jr. has a baby bottle-like shape, referencing the fact that the Splattershot Jr. is the starting weapon for beginners. Due to the Splattershot Jr. having a 110% ink tank instead of the usual 100%, The Custom Splattershot Jr. can throw two Autobombs even without Ink Saver (Sub).